Tulsa County Commissioner John Smailgo (fresh from his re-election Tuesday Nov. 2) addressed the Collinsville Chamber of Commerce Thursday. Nov. 4th at their monthly general meeting. Smaligo provided status on the Collinsville S-Curve re-alignment which is a joint effort by the city, county and state. Utility relocation is underway and construction (by the county) is likely within about160 days. City and AT&T utility relocation should start soon and gas relocation has begun. Commisioner Smaligo indicated $2 million from the 4-to-Fix the County funds were in the process of being transferred to the S-Curve account. The city has also recently requested county assistance with bridge maintenance on some local bridges which the couny will evaluate to determine if they can effectively assist. Smaligo indicated another project he has in the works is a more central location (in District 1... the green north area in the county map at right) for the road maintence facilities. Existing property being sold could help pay for a more rural location. 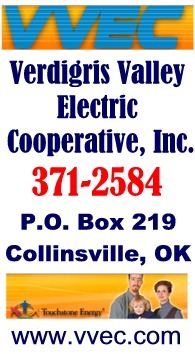 Local County property will likely be approved soon for testing by the Collinsville Soil Program. The 4-to-Fix The County sales tax is set to expire at the end of September 2011 unless commissioners decide to put it to another vote. The topics is complicated with the City of Tulsa already extending their road improvements with that same 2/10 cent allocation on that date. Juvenile Justice improvements are also on Smailigo's wish list for the county.